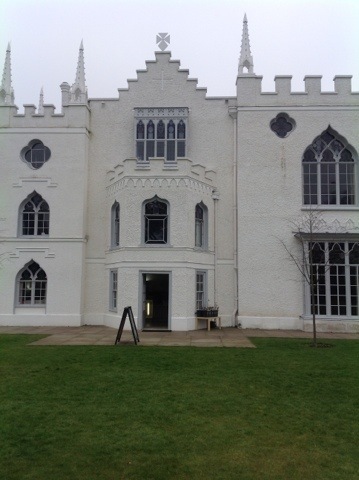 Recently I went to an excellent Gothic conference, which was all the more exciting for being held at Strawberry Hill House, the home and Gothic castle of Horace Walpole (1717 – 1797). There is an ongoing restoration project at Strawberry Hill, so at the moment one can’t see Walpole’s private rooms, but the rest of the house offers a wonderful insight into the mind of the instigator of the Gothic novel and the most extravagant decorator ever! Walpole chose the site, with a small cottage on it, for its peace and its view of the Thames (now obscured by more recent buildings), and built upon, over and around the existing cottage to create a perfect example of his own taste, heavily influenced by the medieval Gothic (particularly in cathedrals) which he had seen in Europe on his Grand Tour. He described the house in a letter as ‘a plaything-house … the prettiest bauble you ever saw’, and so it remains. Despite its crenellations and little spires, it is not very large, but it is full of the atmosphere of ‘gloomth’ that Walpole aimed for. 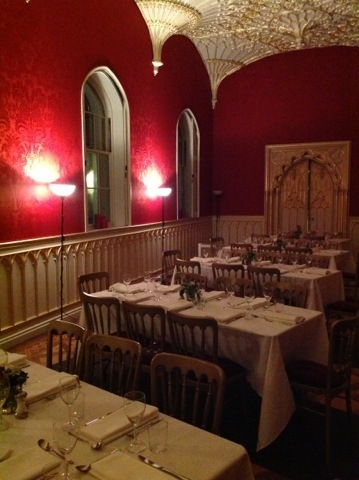 The house has been restored, and it is now possible to appreciate the extravagant grandeur of the gilt ceilings, the stained glass, the spectacularly-coloured rooms and the striking architecture as they once were – what has not been restored has been reproduced, and the house gives a really atmospheric sense of Walpole’s presence. The (reproduction) lantern in the main stairwell is beautiful, exactly what one expects in a Gothic castle, and above it is the landing which served as the ‘armoury’, where Walpole first dreamed of a giant hand in a nightmare which he rewrote as The Castle of Otranto. Over the course of the conference there was, of course, much discussion and several papers on Walpole, his house and its contents, and his legacy. What the tour of the house and the papers I heard made clear is that Walpole was deliberately recreating something: he wanted to fake what he didn’t already have: an ancestral Gothic castle that evoked the great medieval architecture of Europe but, at the same time, irrevocably linked himself and his family with English history. 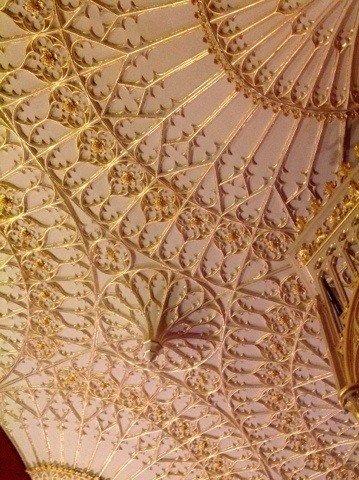 The library’s ceiling shows crusaders, one of whom Walpole believed to have been his ancestor; he had locks of hair of monarchs, and other symbols of English history. He was, I think, extravagant, pretentious, passionate, and a very interesting man, a historian and antiquarian as well as writer of Gothic novels and aficionado of graveyard poetry. The conference was a credit not only to the organisers (at St Mary’s University College) but to Walpole’s remarkable vision; the two days of papers and discussions demonstrated the multiplicity of Gothics which have arisen in their different forms since Walpole first began work on Strawberry Hill. There is an excellent video introducing Strawberry Hill here. And in 2010 I was fortunate to see the V&A’s exhibition of Walpole’s collections (which I blogged about here). A much more detailed review of the collections is also available here, while the Lewis Walpole Library at Yale has an online database of the collections which is fascinating and gives an excellent idea of the objects which filled the house. Visited here two weekends ago. Happened to be passing on my Brompton bicycle en route from Box Hill to Euston. Free entry – I forget why! Terrific!